Tweaking Windows 8.1 can be daunting, especially if this is your first introduction to the modern interface. Here’s a free tool that makes it all easier. Windows 8.1 received several improvements over the first iteration of Windows 8. For instance the Start button is back, you can make the desktop and Start screen backgrounds the same, boot straight to desktop, and organize the Start screen more easily. While all of that is true, you need to hunt and peck your way through various settings and might not know where to start – especially if Windows 8.1 is your first introduction to the modern UI. To make things easier, the folks over at The Windows Club have created a clean freeware utility called Ultimate Windows Tweaker (UWT) 3.0. This utility makes the process of getting your new version of Windows just how you want it with over 170 included tweaks. It includes tweaks for performance, security, Internet Explorer 11, interface customizations, getting system information and much more. 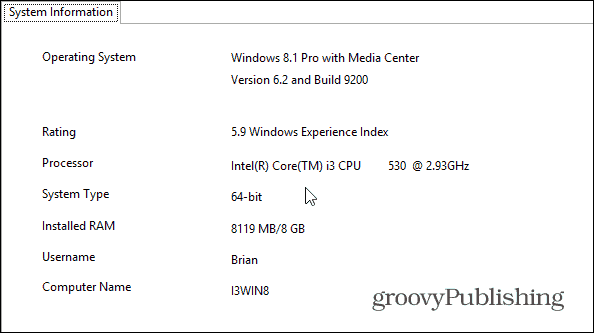 Speaking of system information, in Windows 8.1, Microsoft has removed the Windows Experience Index (WEI) feature, and we covered a few ways to get it back. The first thing you’ll see after launching UWT is the WEI – so you can add this to the list as well. Before making any changes to your system or registry, we always emphasize backing it up or creating a Restore Point. Within UWT you can create a Restore Point with a click of a button. If something were to go awry, it will be easy to get your system back to how it was before the changes. According to the download page, some security software might report it as being malware because it makes system changes. I can confirm it’s clean and malware free. I ran it through VirusTotal and it looks like Ad-Aware, BitDefender, and F-Secure report false positives on it. This is because some of the tweaks will change system settings as well as Registry values. If you’re not quite sure what one of the tweaks in the utility will do, just hover over it and a balloon will pop up with some helpful information. 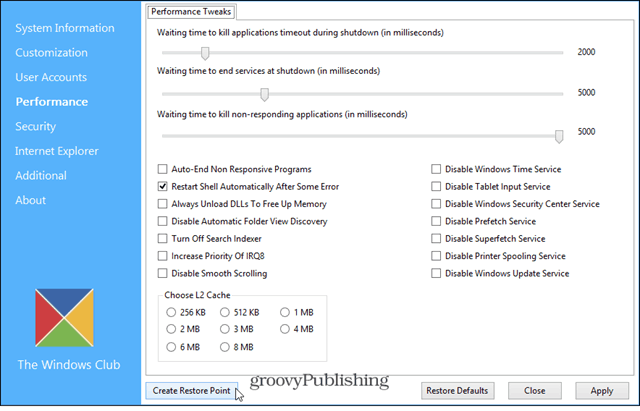 If your not a fan of tweaking Windows settings individually, this is a handy utility to have on hand. the other cool thing is it doesn’t require installation. So it’s a good tool to have on your USB flash drive, especially if you find yourself using different machines during the day.